Water sensors monitor liquid levels and trigger an alarm light and/or sound to warn workers when levels are either above or below a given threshold. 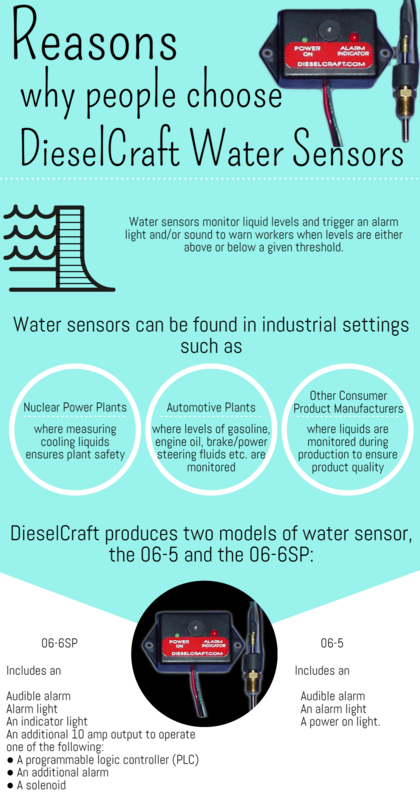 Water sensors can be found in industrial settings such as nuclear power plants, where measuring cooling liquids ensures plant safety; automotive plants, where levels of gasoline, engine oil, brake/power steering fluids etc. are monitored; food and beverage companies and other consumer product manufacturers, where liquids are monitored during production to ensure product quality, and so forth. Water sensors are also key components of industrial filtration systems and wastewater management, especially tanks used for water storage and water treatment. * 06-5: Includes an audible alarm, an alarm light and a power on light. Both models include a sending unit and a self-grounding NPT/stainless steel probe. The sending unit is dual voltage direct current (12/24V DC), which allows consumers to use the water sensor anywhere in North America (24V DC) or Europe (12V DC). This flexibility is of particular interest to companies with plants located in both regions, since the water sensor can be used at any of the company’s locations. The probe consists of ⅛” national pipe threads (NPTs) with a stainless steel probe. Because the probe is self-grounding, the unit’s reading are based on stable voltage, which ensures accurate readings. Self-grounding also eliminates the need to alter a metal area in the filtration system in order to provide the necessary surface for grounding. The probe can differentiate between water and other fluids, and detects the difference between the two so that if intermingling occurs, the unit’s indicator light illuminates. When the indicator light illuminates, the unit’s instruction panel instructs the user to open the valve and remove the water. This feature helps in quickly resolving errors associated with intermingling. For environments where safety is highly regulated or otherwise emphasised, DieselCraft water sensors are especially appropriate, since the sensors are fire-resistant due to their inability to induce an electrical spark. Rather, the maximum current that the probe can drive through a conductive fluid is less than 0.04 milliamps, while the probe’s maximum voltage is less than 10 volts. This combination of self-grounding, fire-resistance and alarms (alarm light, alarm sound and indicator light) makes DieselCraft water sensors a safe system to implement in one’s industrial setting. When consumers weigh this safety along with the convenience afforded by dual voltage (and the additional output included in the 0 6-6SP model), it’s no wonder that DieselCraft water sensors are a product relied upon by industries across the Western world. For more information about DieselCraft water sensors and other products in our product catalogue, contact us at +61 2 9533 4433.